Mr. Winfield: [to Jim] Hello, what's your name? I guess we're going to be neighbors. I've seen this Doris Day-Gordon Mc Rae film a number of times. Actually I first saw it as a little boy when it premiered in 1951. I thought it was a fairy tale then and I still do now. But it's a delightful fairy tale and last night I shared it with my twelve and a half year old son. 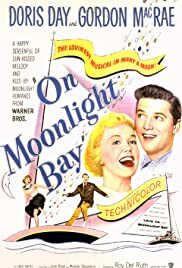 A combination of "Father Knows Best" and "Dennis the Menace" with music, "On Moonlight Bay" gave American audiences during a Cold War and a hot Korean conflict the cinematic equivalent of comfort food. All the characters are witty and caring and there's mischief without mayhem. The only violence is a snowball fight and the sole injury is a twisted ankle. The sweetness of the courting couple is what we all want for ourselves but rarely if ever experience. With the mad senator from Wisconsin searching for communists everywhere, the script allowed its male lead to express extravagantly immature ruminations about the evils of patriotism before he, of course, awakened to his duty. This film is from Warner Brothers, the same folks who gave us the Department of Defense funded "Red Nightmare" with Jack Webb. I wasn't surprised that my son liked the movie a lot. Even at his age he needs and appreciates a good escape from a world less gorgeously delightful than the screen version. Doris Day is very good although her real age is hard to disguise as she acts the teenager. They don't make musicals like this any more. They can't. Our sensibilities and experiences demand the exotica of films like "Moulin Rouge." "On Moonlight Bay" is a great trip back to an increasingly questioning and insecure America that could imagine a past as happy as that portrayed in the film. I'll see it again. And again.